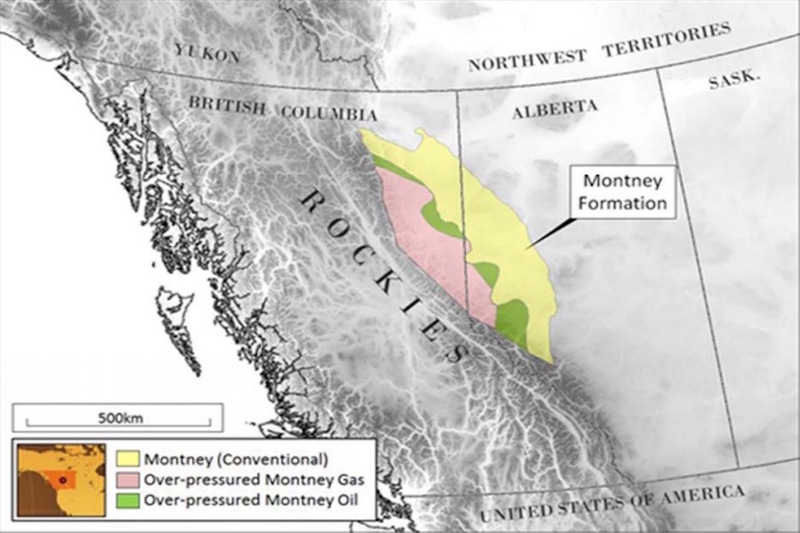 The rebirth of Azonto Petroleum as a substantial player in the shale gas boom sweeping Canada’s Montney Formation is a major step closer after the company locked in commitments for an equity injection of at least $2.25 million this week. Azonto reported today that it had received firm commitments for $2.25 million in equity funding from European investors. In what appears to be an endorsement of the Azonto’s new direction, the new investors will pay 0.045 cents per share, over half a cent per share higher than the expected post consolidation share price. Last month Azonto announced a series of transactions that will see the company reborn as Calima Energy with a substantial acreage position in the revered Montney oil and gas formation in Canada. The liquids-rich shale gas play has recently emerged as one of the hottest petroleum properties in North America. The estimated commercial volumes of petroleum across the basin are staggering with Canada’s National Energy Board estimating 449 trillion cubic feet of gas, 14.5 billion barrels of natural gas liquids and 1.1 billion barrels of oil to be contained within the formation. A number of the early movers in the Montney, including Encana, Seven Generations Energy and Black Swan Energy, are achieving spectacular and highly profitable growth, thanks in part to cost reductions that have substantially lowered well costs. With the guaranteed success of its prospectus issue, Azonto is now well on its way to securing its own piece of the Montney Formation. The Perth based company will farm into a 55,000-acre project in the Montney where it has the right to earn up to 55% of the project by February 2020. As part of the transaction, unlisted Perth company Calima Energy will backdoor list into Azonto, taking with them a 4.5% share in the Montney project. The company advised that it expected to file a prospectus, which will seek up to $4.5 million with oversubscriptions, by the end of the month, to be followed by a shareholder meeting on the 14th of July to approve the acquisition and Azonto’s name change to Calima. Azonto’s rebirth as Calima Energy will see a highly regarded team of petroleum geoscientists behind Calima join the management team of the listed entity. Azonto chairman and well-known Perth corporate player Glenn Whiddon will retain the role of chairman, while Alan Stein and Jon Taylor from Calima will take up the roles of Managing Director and Technical Director respectively. Stein and Taylor come with a big reputation having previously founded Fusion Oil and Gas plc and Ophir Energy plc. Ophir listed on the London Stock Exchange at two pounds fifty in 2011 and hit a peak of six pounds in 2012, where it ranked in the FTSE250 with a market cap of nearly two billion pounds. The new money committed to Azonto as part of the new equity injection is headlined by an entity associated with Clarion Finance, a Singapore-based family office with operations in Europe and Asia.